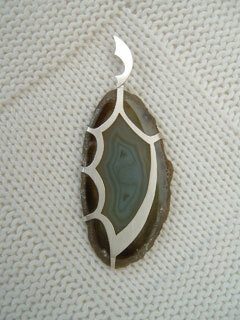 This was the last in a series of 9 agate pendants. The settings are each designed around the pattern of the stones. This one is a departure from the other designs in that the stone clasps fold behind the stone rather than to the front. This allowed me to design a frame that closely follows the delightful pattern without obscuring it. The pendant swings from a rider link that is attached by a hand crafted hinge and complements the pattern of the setting.